How many more times are we going to go through this? Another Autumn series gets underway with a defeat to one of the Southern Hemisphere giants. However it was the manner of this defeat which was so galling. If anyone is looking to take positives from that performance then they are frankly deluded. Wales should be ashamed of that first half performance. Utterly ashamed. There were moments when Australia were simply executing plays as if they were going through a training session. The Wallabies have probably had more intense training opponents than the limp resistance which Wales offered. Statistics can too often be used to prove anything. But the facts are the facts and for Wales they make for grim reading. Wales have not won the opening match of the autumn since they defeated Romania in 2002. Stop playing the big boys. You are wasting everyone’s time and are just after our money. Wales under the Gatland/Edwards/Howley regime, installed 8 years ago now, have claimed 1 victory over Australia and another over South Africa in 2014. Add the All Blacks to the stats and that means 2 victories in 32 matches. A win percentage of 6.25%. If insanity is the repetition of events expecting different results then we are well beyond that point by now. I for one am sick of the excuses. They are being trotted out on such a regular basis that they have now become cliches. Classics such as, “we need to test ourselves against the best teams to learn” and “we always start slowly and get better the longer we are together” would be more appropriately used as the tag lines by the WRU marketing department. Further blame is directed on the suitability of the Pro12 to prepare our players. Firstly, not all of the starting lineup, North, Roberts, Halfpenny and Charteris for instance, play in the Pro12. Secondly, anyone fortunate enough to see Ireland’s performance against the All Blacks, mere hours after Wales’ debacle, saw that argument evaporate for ever. The Welsh players and coaching team are comfortable in their malaise. Their press conference responses are prepared repetitions of those that have gone before. Oddly the Ireland v New Zealand clash took place in Chicago, USA. Therefore the Irish had to deal with the rigours of transatlantic travel. But yet the Irish players raised their game to levels unreached in 111 years. They played at pace and with an intensity and aggression which pressured the All Blacks throughout. Wales took a bus down the M4. They fell off tackles and looked so bewildered you would’ve thought that they were the team suffering jet lag. From their first lineout Australia flowed over the gainline and did not yield that momentum. Many fans were left bewildered by the selection of Alex Cuthbert for yesterday’s game. Wales attempted to trick the Wallabies by putting him on the left wing, rather than the right. But the smart green and golds targeted him immediately. A series of cross and box kicks exposed him early on, allowing Australia to regain the ball. This resulted in the extraordinary 80% possession statistics. Any youngsters wishing to watch a textbook control of a match then this was the game. Fortunately for Wales the Wallabies did butcher a number of opportunities to rack up points. Dropped passes but also 11 points missed at goal. So it could, and frankly should, have been worse. Conceding 32 tries in the last 6 matches is as bad as it gets. Shaun Edwards’ reputation is in tatters. No longer can he justify his position based on the 2 tries conceded during the 2008 Grand Slam season. Astonishingly Wales didn’t leak a try when reduced to 14 men. But the way that they were sliced apart with a full complement, with basic passing skills largely, was truly worrying. The ‘up and under’ kicking strategy also reared its head again as the ball was gifted to the dangerous Israel Folau on numerous occasions. I thought Ross Moriarty carried the ball well. Scott Williams’ try also demonstrated that when players play what is in front of them and back themselves they can do good things. But once again Wales’ inability to convert overlaps with the line at their mercy is staggering from supposedly “professional” rugby players. The danger now is that the Welsh public are on the verge of abandoning this team of under-performers. As a result there were nearly 20,000 empty seats in the stadium, not helped by the £60+ price tag. In contrast Wales’ footballing counterparts are delivering on the field. Next weekend they play Serbia in a World Cup qualifier. It is no wonder therefore that tickets for the Argentina rugby clash are so freely available. We are talking tickets for £20 now. Those are still available but the Welsh public isn’t interested. This is a shame because Argentina are playing some superb rugby this year. They took apart Ireland at the World Cup last year and are threatening to do the same to Wales. Short of some drastic changes both on and off the field Wales are in real danger of slipping out of the top 8 in the World Rugby rankings. Just in time for Rugby World Cup seedings once again! Australian rugby union is in a bit of a crisis. The Wallabies have lost the last six in a row. Three against England and three against the All Blacks. As a neutral observer I am simply astounded by the way in which they have constructed a defensive formation in an attempt to hide their frailties. The selection of Quade Cooper caused a few raised eyebrows this week but given the poor showing in Sydney there wasn’t really much more to lose. However, this selection of a mercurial talent with ball in hand is also one of a defensive liability. For a number of years the Wallabies have attempted to hide Cooper from the firing line and that strategy continued yesterday. Unfortunately this means that their defensive system from first phase is a mishmash of players out of position with no leadership and limited structure. Let’s start with New Zealand’s first try. Bernard Foley, the inside centre is defending blindside wing with scrum half Will Genia. Back rowers Hooper and Pocock are out defending in the 10 channel. Outside them left winger Adam Ashley-Cooper is with Kerevi the outside centre and right winger Haylett-Petty is at an outside centre position. Israel Folau is then on the wing with Quade Cooper covering fullback. Even if this is all intended they are then undone by individuals flying up and missing tackles. Hooper puts pressure on Barrett successfully but in the very next phase Stephen Moore flies out of the line and takes the wrong man giving tighthead prop Franks a gap to run into. The try is then finished off with simple hands and a massive overlap. The All Blacks’ second try is fairly similar, scoring from another maul formed at the lineout. Adam Ashley-Cooper (14) has had to go off so new cap Hodge (23) was now left defending at outside half with Kerevi (13) and Haylett-Petty (11) outside with Folau again on the wing. Unfortunately these players get sucked in because Beauden Barrett was not first receiver and looped around. Although as Michael Lynagh identified in the UK coverage there was a suspicion of a trip to Kerevi, who ended up on the turf, the green and gold jerseys were just flapping at All Black shirts. This was summed up perfectly by a covering Quade Cooper’s traditional turnstile-tackling technique. The third try is really obvious. With Quade Cooper having dropped back defending the blindside wing, Aaron Smith targets him with a box kick. Dagg easily beats him to the ball and New Zealand have possession, field position and momentum. Beauden Barrett’s exquisite pass to put Ben Smith outside the defending Haylett-Petty to create the overlap however was the icing on the cake. New Zealand’s fourth try was again from first phase possession that exposed the Australian defensive arrangement. Once again Hodge, Kerevi, Haylett-Petty and Folau provide the defensive line with back rowers Hooper and Pocock providing further cover closer to the maul. Things are not helped with a missed tackle on Ben Smith which makes the try an inevitability. Even when Smith is brought down there is no other last ditch tackling with Quade Cooper again clutching at thin air and failing to prevent Aaron Smith getting the ball away, leaving Folau with an impossible job of keeping out Sam Cane. These defensive frailties result in Pocock and Hooper’s skills of competing at the breakdown to be negated as they spend more of their time making tackles for others in the team. Quade Cooper and Bernard Foley had such little possession to work with given the Australian lineout was again being picked off that it made their presence on the field more problematic than beneficial. For instance, Cooper is thought to have made just 2m for his four carries. Surely Cheika’s gamble on selecting him backfired big time. England Rugby were under no illusions yesterday. Failure was not an option. However, England have become the first hosts in Rugby World Cup history to fail to advance from the pool stages to the quarter-finals. I have some sympathy with England, even though I was firmly supporting Australia. One of 3 quarter finalists from 2011 were not going to reach that same stage in this tournament because of the draw. Devastatingly for England fans, it is them that has missed the cut and so the postmortem has begun, despite them needing to play Uruguay next week in a match now made effectively meaningless. Problems began even before the tournament for England. Manu Tuilagi, who had cemented his place as one of the starting centres, admitted to assaulting two female police officers after an altercation with a taxi driver in Leicester city centre and was appropriately removed from contention for the England squad. Next Dylan Hartley received yet another ban, this time for a headbutt, which ruled him out of the opening Fiji game and so he too was removed from the squad. Despite these setbacks England were feeling positive having beaten Ireland and France in the warm ups and after overcoming understandable nerves a bonus point victory was sealed against Fiji. The next game was crucial and there was huge debate about the backline selection. Rugby league recruit Sam Burgess was drafted in as a defensive force in the midfield to counter the physicality of Welsh pair Jamie Roberts and Scott Williams and performed reasonably well but made errors stemming from his limited experience of rugby union and particularly in the centre. England had control of the game but Wales produced the magic which England could scarcely dream of to create a try out of nothing and sealed a famous win against incredible odds. Selection for the Australia game was equally debatable. Burgess was dropped, Brad Barritt moved back across to his more familiar inside centre birth, and Jonathan Joseph came back in having been injured the previous week. The outside half debate continued with Owen Farrell keeping the 10 jersey following a solid performance against Wales. Up front, Australia were bound to pick the phenomenally good Hooper and Pocock combination and England didn’t react to that. 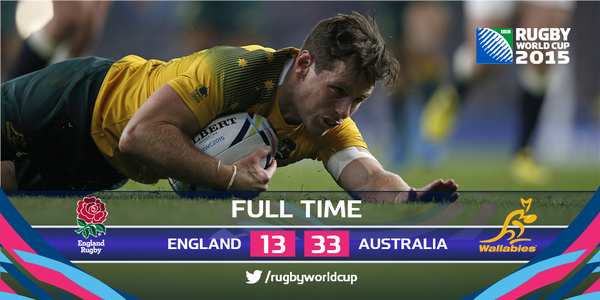 As a result Australia dominated the breakdown, Pocock with 3 notable turnovers. More surprisingly the England scrum was taken apart by Australia, highlighting the huge void left by the absences of Dylan Hartley and players such as Alex Corbisiero who has been plagued by injuries. At half-time England were already 17-3 down having been cut open by Australia’s incisive running but had little response during the first 40. An inury to Jonny May called for desperate measures as George Ford was brought on to add some more creativity and positivity. A try from Anthony Watson was the result of the only meaningful moment of forward running and momentum but the Wallabies still had total control. Chris Robshaw came in for substantial criticism last week for turning down the opportunity of three points to draw the game and this was his moment to stand up and lead the team. Instead he looked like a lone soldier trying to hold back a green and gold tidal wave. Much was made of his omission from the 2013 Lions squad but perhaps this performance proved that he was not equipped for the Australian back row battle and it was indeed the correct decision to make. Ultimately that is what happened, through no lack of effort but simple ability England were beaten two weeks in a row by better performances, more effective game management and higher skill levels. This is where Stuart Lancaster comes into the debate. I have no doubts that his team were well prepared but when it came to vital elements such as team selection, which largely dictates strategy, things appeared muddled, with no definitive outside half or centre pairing to manage the game. The Foley/Giteay axis for Australia was composed and controlled the game perfectly. On the opposite side, Farrell received a yellow card, Burgess could equally have gone in the same moment, and that sealed the result. A well finished try from Giteau gave the scoreline a slant more reflective of the game and England were officially out. It was disappointing to see fans leaving before the final whistle, the same supporters who had built up the players to ‘giants’ with few results or Six Nations trophies to support that, as popularised in a mobile phone provider advert, will now be knocking them back down. Perhaps like the national football team they are victims of their Premiership competition and the foreign imports in those squads. In 2007 Gareth Jenkins failed to get Wales out of the pool stages and lost his job the following day. Hopefully, a time of reflection and review will occur before a decision is made on the coaching teams future. There is still that game against Uruguay to come after all. Next week Wales and Australia will battle for who finishes top of Pool A. The positive for both teams is that they will fancy beating whoever they face in the quarter finals, be that South Africa, Scotland or even Japan given the way Pool B has developed. Wales would love to get a victory over the Wallabies and exorcise some recent agonising loses but would be confident facing a Springbok team short of their usual aura.